Today I would like to talk about spices. These can be used by any constitution type. Spices have a power to bring out the best in every dish, keep your taste buds entertained with new flavors, while making food easier to digest and allowing nutrients to absorb. If you don’t have time to cook — don’t skip this article. You can use most of the spices by adding them to already cooked foods, such as soups, salads, and hot dishes to intensify flavors. 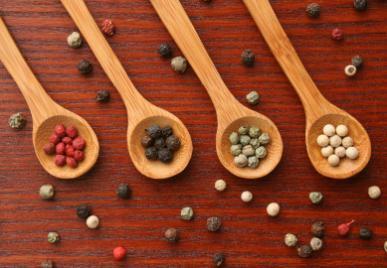 Spices can transform the entire meal by making it more suitable for the current weather or ailment. For instance, adding some ginger or turmeric to your soup will relieve indigestion, while sipping fresh ginger tea will re-energize you. Below is the list of the most highly regarded spices in Ayurveda. You can get spices at any food store or at Kalustyan’s specialty store, if you want the largest selection of authentic Indian spice treasures. Black pepper: Pungent and heating, this spice acts as a stimulant and kindles agni, digestive fire, increasing the secretion of digestive juices and helps destroy toxins. Black pepper is good for Kapha and Vata, working on the circulatory, digestive and respiratory systems. Pitta types can use black pepper in limited quantities and mix it with ghee or other oily base. Cinnamon: Pungent and sweet, this aromatic bark of tree is an effective spice for strengthening and enhancing the flow of circulation. It has antiseptic and detoxifying properties. It is particularly good for strengthening and enhancing the flow of circulation. It create internal heat and has a natural cleansing action which is why it is a widely used home remedy for colds and flu, and aids in the absorption of other medicines. 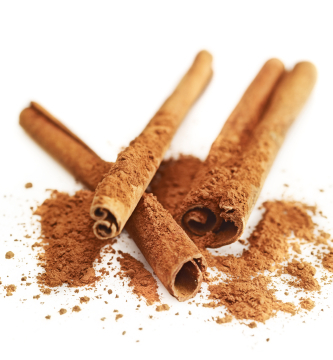 Cinnamon is an excellent addition to all the desserts, helping your blood sugar level stay stable and prevent blood sugar level spikes. 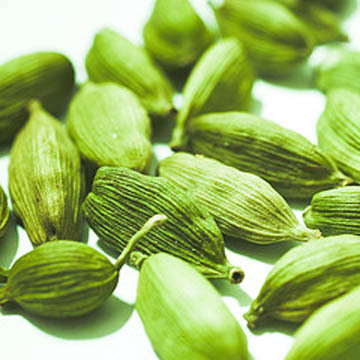 Cardamom – Cardamom clears food cravings and refreshes the palate. It destroys mucous in the stomach and upper GI. Cardamom can alleviate indigestion, gas, morning sickness, and acidity. It assists in the digestion and assimilation. Cardamom is a versatile, pleasant and aromatic spice used in beverages, main courses, and desserts, with sweets, savory dishes, and fruits. Ancient Egyptians chewed cardamom to whiten their teeth and sweeten their breath. If you are not sure how to use cardamom, try to sprinkle it in oatmeal prepared with milk or experiment with this healthy pancakes. Cilantro or Coriander: Whether it’s the green leafy fresh cilantro or the grounding earthy coriander seed, this should always be on hand. The cilantro leaf acts as a cooling balm to disturbed digestion and the seeds are balancing to all doshas. Famous in Ayurveda as one of the three spices (along with fennel and cumin), it is used to balance and reset the body and mind. 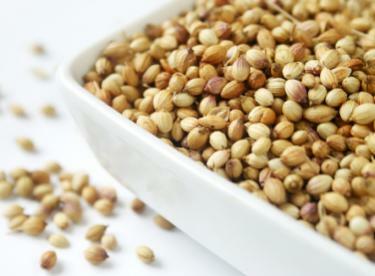 Coriander is a great natural defense against allergens, as well. It is valuable for skin ailments and known to improve eyesight. Try adding cilantro to your salads, sprinkle on soups, or add to spicy foods. Crushing the leaves releases enzymes that break down aldehydes and destroy the ‘soapy’ or ‘buggy’ odor of cilantro. Try it crushed in a mortar and pestle, chopped or served as a pesto. 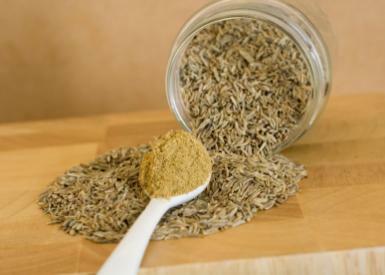 Cumin: It is considered invaluable for digestion. Cumin is a cleansing spice and helps burn ama – digestive toxins – that are considered the starting point of many disorders by ayurvedic healers. Cumin helps enhance the appetite, and is helpful for the stomach, the liver and the intestines. Cumin has antimicrobial properties and it is the second most popular spice in the world after black pepper. It has a strong aromatic smell and a slight bitter taste. Warm earthy tones make it a staple in soups and stews. Cumin seeds are generally sautéed in ghee and added to prepared dishes just before eating. Ground cumin seeds can be added directly to prepared foods and yogurt. In Ayurveda, we use a special digestive yogurt drink made with Cumin. Get it here. Ginger: A must! It brings flavor, spiciness and sweetness to food and is used widely as a digestion aid. It is an excellent remedy for respiratory conditions and to prevent colds in the upcoming cold season. 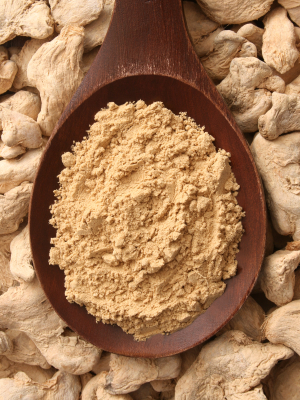 Ginger is an invigorating spice and is known as ‘the universal medicine’ for its versatility and healing properties. It increases agni (digestive fire), neutralizes toxins, and helps digestion, and absorption of food. It can be used both fresh and dried. Ginger can be used to make refreshing spicy tea or in soups, stews, and appetizers. I always start my day with a large cup of steeped fresh ginger tea with lemon and a stick of cinnamon. Simple, yet very energizing! 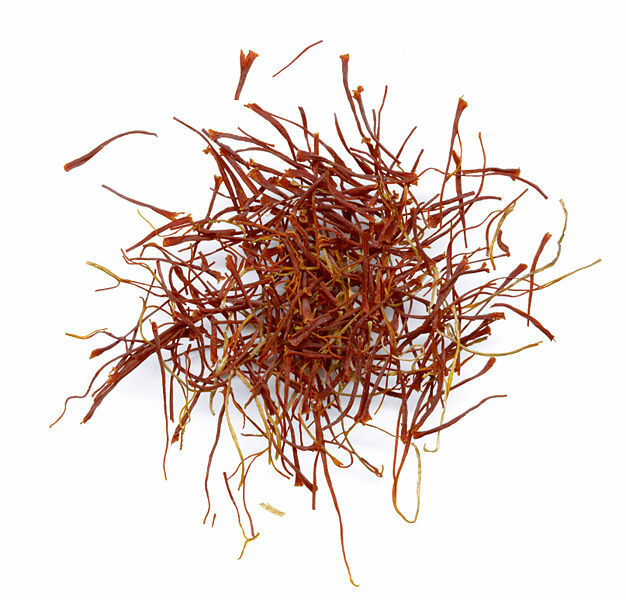 Saffron – Saffron is a golden, aromatic spice obtained from the delicate red stigma of the Crocus sativus flower. Roughly 80,000 flowers must be harvested from this perennial to yield merely one pound of saffron. As a result, saffron fetches a lofty price of up to $2,000 per pound. Although long valued for its exotic aroma and warm, slightly-sweet flavor, saffron has a long history of traditional medicinal use, employed among other things as an aphrodisiac, energy-enhancer, digestive aid, cough suppressant, antidepressant and analgesic. Modern research indicates saffron’s potential as an anti-carcinogen, which includes chemicals that may reduce the occurrence of cancers. Saffron’s flavor and chemical components are only released in hot water, milk or citrus. Try this warming Rice Pudding for dessert. Keep it Spicy! And let me know what your favorite spices are and how you use them! I would love to know! This entry was posted in Uncategorized and tagged Ayurveda, Black pepper, Blood sugar, Cardamom, Coriander, Cumin, Digestion, digestive, recipe, rice pudding, Spice, yogurt. Bookmark the permalink.